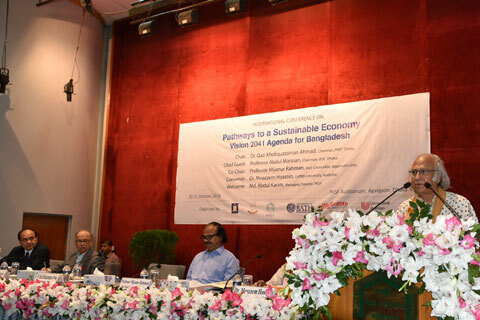 “Bangladesh needs to ensure a society which will be free from corruption and inequality to achieve the vision 2041″, Speakers urged at the International Conference titled “Pathways to a Sustainable Economy: Vision 2041- Agenda for Bangladesh” held at Palli Karma-Sahayak Foundation (PKSF), Dhaka on 30-31 October 2018. 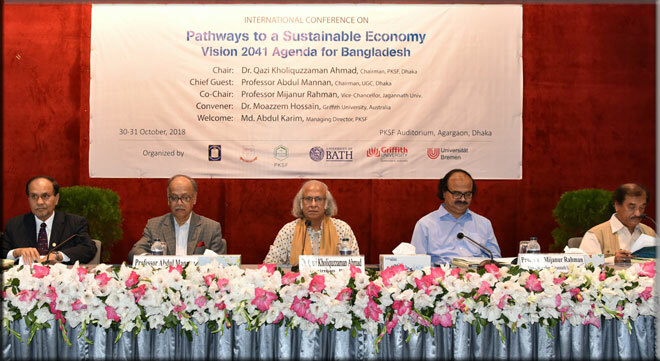 In addition to the opening and closing sessions of the two-day International Conference, six breakout sessions were held where papers on different emerging development issues of Bangladesh, relevant to the ‘Vision 2041′, had been presented & discussed. Chairman of PKSF Dr. Qazi Kholiquzzaman Ahmad chaired the inaugural session of the conference, while University Grants Commission (UGC) Chairman Professor Abdul Mannan Delivered a speech as the Chief Guest. Managing Director of PKSF Mr. Md. Abdul Karim also delivered the welcome speech. Dr. Qazi Kholiquzzaman Ahmad said that Bangladesh has already had a good number of economic and social attainments. All difficulties, including those with manpower, terrorism, corruption and political stability, need to be addressed properly to consolidate these achievements. In order to overcome obstacles, everyone should be included in development process. He also added that no-one would be left behind and the spirit of the Liberation War of Bangladesh would get prioritized to achieve SDGs. 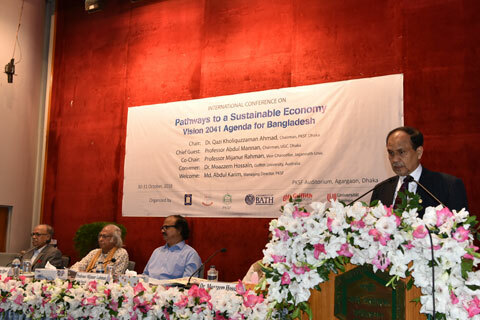 Professor Abdul Mannan said that Bangladesh made a significant progress in economic development. But the biggest challenge is sustainability. To achieve sustainability, we need political stability and the government needs to concentrate various potential areas for further development. If corruption is ceased, then it is possible to increase the current GDP by 2%. In the welcome speech the PKSF Managing Director Mr. Md. 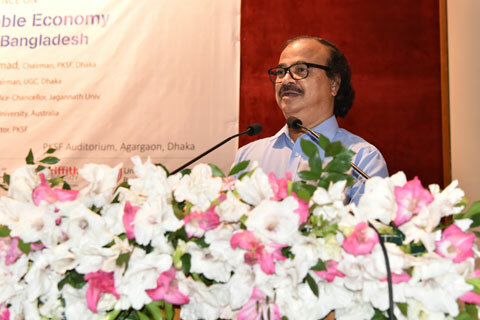 Abdul Karim highlighted the comparative picture of the economic growth of Bangladesh, saying that 4% growth of 1990 has reached at 7.86 in the year 2018. Referring to the expectation and achievement of the people of Bangladesh, he focused on ensuring sustainable economy, minimizing the gap between region-based unequal developments and eventually the development of the financial institutions. Local and foreign experts presented a total of 15 papers on a few policy directive topics such as industrialization, agriculture, food security, public health, nutrition, and climate change at the conference which ended on 31 October 2018. 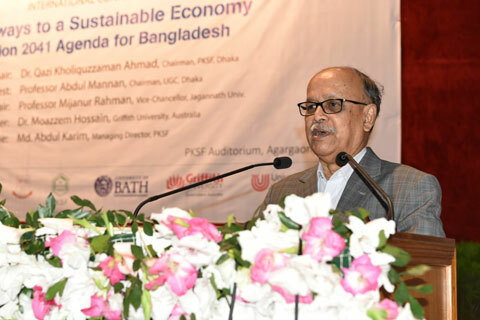 The conference was organized jointly by the Palli Karma-Sahayak Foundation (PKSF), Dhaka School of Economics, Jagannath University, Griffith University of Australia, University of Bath, UK, and Bremen University, Germany.